As the summer comes to an end, it’s time to plan your winter vacation! Most people adore summers, but c’mon, who doesn’t like to play in the snow? Who doesn’t play like a child even if it’s for 5 minutes when it snows enough to have a snowball fight? That’s why I want to give you some ideas for winter vacation spots in the US! No matter what kind of traveler you are, you’ll certainly find a winter trip for your taste here because there are not only snowy spots in this post. Oh, no! If you’re not a fan of a real winter, this post will give you some nice ideas for your US bucket list! So enjoy! 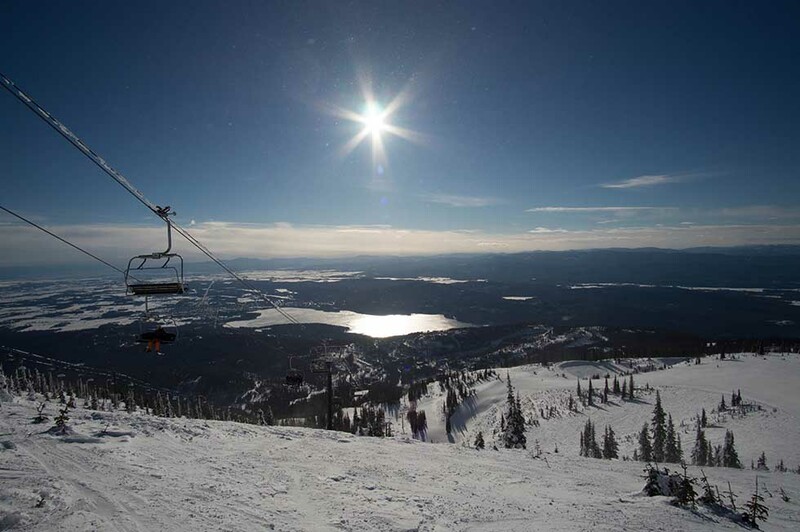 Whitefish, Montana is a wonderful winter destination, especially for those who love winter sports. Skiing the Big Mountain is the first attraction that comes to mind. With frequent dumps of knee-deep powder and inversions making the top of the mountain warmer than the valley, skiing the Fish offers endless on and off-piste opportunities. If skiing isn’t fast enough for you, there is always the World “Skijoring” Championship held every January where brave skiers are towed through an obstacle course by a horse. If that sounds more terrifying than fun, you can go snowshoeing in nearby Glacier National Park and there are Nordic ski trails set around the golf course in town. A visit to Whitefish isn’t complete without trying a burger at The Bulldog Saloon where the bathrooms are as much of a reason for visiting as the food. That said, one of my favourite places to eat in Whitefish is Craggy Range where there’s local craft beer on tap and slightly healthier options to balance out the Bulldog burger. Click here to check accommodation in Whitefish! If you’re looking for one of the best winter wonderlands in the US – Breckenridge, Colorado has you covered. This small city is nestled in a valley with several mountains of excellent skiing available. What makes Breckenridge unique is it’s Victorian mining town roots. The main street is not only adorable, it’s very walkable and has wonderful shops. There are play areas and museums for the kids and plenty of choices for the adults. Park your car and walk almost everywhere or catch a bus. The ski resort is probably one of the best in the world and frequently hosts international events. Don’t like to ski or looking for other activities? Breckenridge (or nearby resorts) have snowmobile rentals, carriage rides, snowcat tours, ice/snow sculpture contests, snowshoe hiking, indoor and outdoor ice skating and much more. Some favorite things to do include taking the gondola up to the base of peak 8 and sipping hot chocolate while watching the ski slopes – warning, the hot chocolate is very good but very rich (if you weren’t a diabetic to start you may be one after drinking a full hot chocolate). Also, it’s fun just exploring the town and enjoying some crepes. If you’re hungry for some hardy post-snow day meals – Eric’s is the place to go. There will be a wait but it’s oh, so yummy. Click here to check accommodation in Breckenridge! Pssst: Receive fresh travel tips in your mailbox every month. BONUS: Gain access to our private library full of freebies! Subscribe! Founded in 1630, Boston is an incredible city filled with history, beautiful neighborhoods, good food and fascinating sights. Famous highlights include the Freedom Trail, Boston Common, Fenway Park and Newbury Street. The city is also home to the world-renowned Ivy League Harvard University and an afternoon in the vibrant Harvard Square is a must. As winter arrives on the East Coast and Boston is covered in a blanket of snow, the city is a real treat to visit and there’s still plenty to see and do. Boat rides are replaced by ice skating on the Boston Common Frog Pond and the Skywalk Observatory perfectly showcases the beauty of the city from above. A cold craft beer is a perfect excuse to warm up, the Harpoon Brewery is our favourite, and a spot of indoor shopping at the Faneuil Hall Marketplace will provide shelter from the winter weather! Boston is renowned for its museums and they are a cozy escape in the winter: we love the stained glass globe at the Mapparium in the Mary Baker Eddy Library and discovering more about American history at the Boston Tea Party Ships & Museum. Click here to check accommodation in Boston! Bad news first: It gets incredibly busy at Upper and Lower Antelope Canyon. The good news: You’re going to be visiting in winter when it’s still just as ridiculously gorgeous but the crowds are cut in half. Even more good news? There’s more to Antelope Canyon than Upper and Lower! There are other slot canyons just as beautiful with even fewer people visiting! I visited in winter and my friend and I, along with our guide, were literally the only three people in the canyons! Antelope Canyon in winter is a perfect time to visit and don’t forget the nearby Horseshoe Bend as it’s a must see as well. Click here to check accommodation in Page! From Nina at Where in the world is Nina? Hearty food, chilly-but-not-freezing weather, cozy jazz clubs, and buckets of southern charm: New Orleans in the winter is a delightful idea. While summers are sweltering in New Orleans, winters are surprisingly mild–and offer the bonus of Christmas decor during the season! All the popular New Orleans attractions, from Bourbon Street to beignets, are still waiting to welcome you with open arms in the winter, and the lack of humidity and crowds are a nice bonus. Visiting the bayou, touring a plantation, indulging in a ghost tour and exploring the famous cemeteries of New Orleans are all still tons of fun while wearing a coat (and honestly, sometimes winter in New Orleans doesn’t even require a coat!). Since one of the biggest attractions in New Orleans is its delicious food, you’ll be delighted to know that gumbo, muffulettas, fried chicken, beignets, jambalaya, and more all taste even better when it’s a bit cold outside! The best advice for winter in New Orleans applies year-round: come hungry and ready for a great time, and you’ll end up finding exactly what you’re looking for. Click here to check accommodation in New Orleans! Salt Lake City Utah is the perfect ski destination. They have four world-class ski resorts right within the city limits so you are never more than forty minutes from Salt Lake’s famous powdery snow. 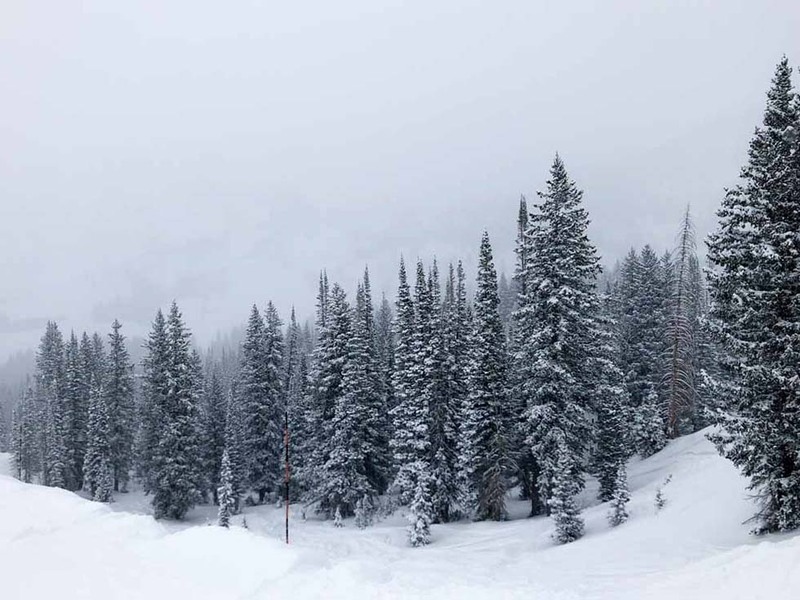 The skiing is “steep and deep” in Salt Lake, which means that you will find more snowfall than any other North American ski destination and the terrain offers challenging runs. Each of the four resorts caters to a different clientele so there is something for everyone in Salt Lake. Solitude is good for people who like wide runs and open spaces. Brighton is great for snowboarders. Snowbird has steep terrain best for upper intermediate and experts. Alta (my favorite) is a no-frills resort that gets the most snow of any resort in Utah. But there’s more to Salt Lake than just skiing. City Creek Canyon has pedestrian-friendly trails that are open year-round. Millcreek Canyon closes for the winter and offers snowshoeing and cross-country skiing in a dog-friendly forest. There is also a fifty-one-mile trail along the Jordan River that is open to hikers, runners, and bikes. Contrary to cultural stereotypes, Salt Lake also has a surprisingly robust craft beer scene and great coffee shops. So, hit the slopes, take a hike and grab a beer in Salt Lake. Click here to check accommodation in Salt Lake City! My family travelled to the US last Christmas in the hope that we could experience a white Christmas. We spent a few days in Washington DC during Christmas week prior to heading up to Boston. Washington DC was cold but not cold enough to stop us seeing what we wanted to see and we spent everyday out and about exploring the National Mall and a few of the Smithsonian Museums. Washington DC doesn’t traditionally see snow in December although January has a very good chance of seeing snow. I think the National Mall would look amazing covered in snow and with other famous Monuments such as Arlington Cemetery and the White House. The various National Museums along the National Mall would provide a good escape from the cold where you could also grab a coffee and snack before braving the cold again. Many of the main attractions are condensed to within a close area and the CBD hotels are easily within walking distance to the National Mall which includes Lincoln Memorial, Washington Monument, Vietnam War Memorial, World War II Memorial, United States Capitol Building and then various Museums that would easily take a week to visit each. Click here to check accommodation in Washington DC! Mammoth Lakes in the Eastern Sierra is a wonderful winter destination in California. The area is beautiful all year round, but in the winter it takes on a special beauty. The town is surrounded by majestic mountains and evergreen forests, and in the winter, the landscape does look like a winter wonderland. And towards the start of the season, when the blue lakes that dot the region have not yet frozen over, they gleam like sapphires amidst the snowy white surroundings. It’s a magical sight! Mammoth Lakes is a very popular winter resort, and the opportunities for winter adventures and fun are endless here. Apart from traditional skiing, you can snowboard, snowmobile, snowshoe, and cross-country ski. Try snow tubing, build a snowman, have a snowball fight! If you just want to take the gondola to the top for hot chocolate and to take in the magnificent views, that’s fine too! How about riding a snowcat (used to groom trails) on a tour to Minaret Vista? Or ice-skating at the local rink? You won’t run out of fun things to try, even if you spend a couple weeks here! There are lots of accommodation options, and at the end of each day, you can return to relax by a fire with a hot drink. That’s the perfect end to a fun winter vacation day! Tip: Mammoth Lakes is very popular in the winter, so book early! Click here to check accommodation in the Mammoth Lakes! If you are looking for a great place to visit in the Winter, then you will be surprised by the number of things to do in St. Augustine, Florida. It not only encompasses some amazing beaches that are great for relaxing and sandcastle making, it also has a great history to keep almost anyone interested. St. Augustine is nicknamed the Nation’s Oldest City with a wide variety of attractions and restaurants. I highly recommend taking a trolley tour when you first arrive to get the lay of the land before you decide on which attractions you’d like to visit. Our family enjoyed the reenactment of the cannon fire at the Castillo de San Marcos, the National Monument in downtown St. Augustine right on the water. A great thing about St. Augustine, FL is that it provides a mild winter allowing you to still enjoy the warm beaches, yet without the crowds that you may find in southern Florida areas during winter months. When in doubt, hit the beaches and just bring a sweatshirt on a cooler day. They are a great place to find seashells and even take a bike ride on the packed sandy beaches. Click here to check accommodation in St. Augustine! Lake Tahoe is great year round, but it really shines in the winter when its famous ski resorts come to life. Skiers and snowboarders are treated to views of Lake Tahoe’s bright blue water sparkling in the sun as they ascend chairlifts and prepare for their runs down world-class slopes. Squaw Valley, one of the top ski destinations in the country, was the site of the 1960 Olympics and offers a museum about the games in addition to time on the slopes. Other resorts in the area are Alpine Valley, Heavenly Mountain, Mt. Rose, Homewood, Northstar, and Diamond Peak. After the lifts close, you can enjoy apres ski dining and drinks at one of the resort villages. South Lake Tahoe has great options right at the base of Heavenly Village. If you’re not too worn out from skiing, you can take a scenic drive along the shores. Tahoe City has pathways along the lake, and the western shore offers particularly nice views of the water. Lake Tahoe is located on the California/Nevada state line approximately two hours east of Sacramento. If visiting in the winter, be aware that ice and snow in the mountains can lead to dangerous driving conditions. Pay attention to road closures and warnings, and bring snow chains in case the weather requires them. Click here to check accommodation in Lake Tahoe! Located about 30 minutes East of Salt Lake City, Park City is the epitome of winter activities. The city has one of the biggest ski resorts in the United States. The city and surrounding areas have many activities to offer including skiing, snowboarding, bobsled riding, exploring the cute town, and so much more. In 2002, Salt Lake City hosted the Winter Olympics. The vast majority of skiing and snowboarding events were held in Park City Utah due to the world-class ski resorts. With that being said, skiing and/or snowboarding is a must! If you are looking for a unique thrill, then make sure to check out the bobsledding track. As you might expect, the track was built for the 2002 Olympics for the bobsled, skeleton and luge events. The track has remained in use. You can now buy tickets to experience a thrilling bobsled ride! The city also features a fun and vibrant area called Historic Main Street that is filled with boutique stores, cafes, bookstores and restaurants. It is the best place in town to relax after an all-day outing at the slopes. Park City offers an endless number of winter activities for all. The city is a fantastic destination for any kind of winter vacation you want to make it. Ease of access and endless activities within minutes. What else could you ask for? Click here to check accommodation in Park City! If you’re looking for an excellent winter destination in the US, New York City is the place for you! This touristy city is actually quiet in the winter if you don’t visit in the Christmas rush. You can get excellent deals on hotels and accommodations during the months of January, February, and March. New York City has a lot of excellent museums which are perfect to enjoy when the temperatures are cold. It’s also quite beautiful under a layer of snow, especially when you visit scenic Central Park, which is especially gorgeous in winter. I also love Prospect Park in Brooklyn, especially the new ice skating rink on the south side of the park which is fun to enjoy in the winter and is much less crowded and expensive than ice skating at Rockefeller center. When you need to warm up and take a break, there are plenty of great places to eat, drink, or enjoy a coffee. New York bars are especially cozy in the winter, and a lot of happy hours include delicious hot spiked beverages like mulled wine which are great to warm you up after being out in the cold. Oh, and consider attending a Broadway show because some indoor entertainment is also welcome at this time of the year! New York in winter is certainly cold in the winter, but there is plenty to do to warm you up, and you’ll save a bundle compared to the high season! Click here to check accommodation in New York City! While winter is not the most popular season for tourists, I think it is one of the best times to visit Chicago. For starters, accommodation costs are lower and the popular attractions are less crowded. There are so many things to do in Chicago but you might want to focus on the indoor attractions when visiting in the winter. Chicago has many excellent and well-known museums including the Museum of Science and Industry, Field Museum, Adler Planetarium, and the Art Institute of Chicago. Other things you can do include watching a play, sporting event or comedy show, listen to music at a jazz club, take an architecture tour and enjoy panoramic views from tall skyscrapers. You can also brave the cold weather and head outside to Millennium Park to see Cloud Gate, the famous mirrored sculpture also known as The Bean. One of the best things to do in Chicago is to eat. Chicago is one of the top cities in the world for food lovers with many restaurants serving every type of cuisine. Make sure try deep dish pizza and a Chicago-style hot dog, two dishes that Chicago is known for. Click here to check accommodation in Chicago! Central Oregon’s dry and sunny climate makes it an ideal destination for outdoor winter activities. Popular cities like Bend and up-and-coming towns like Redmond, Oregon are conveniently located in the high desert, with the Deschutes River flowing through, and surrounded by snowy mountains. Mount Bachelor Ski and Snowboard Resort is just half an hour from town, with over 100 runs. Hoodoo Ski Area is not much further, with an additional 34 ski runs. Both also have spectacular sledding parks. Central Oregon enjoys some of the driest powder in the Pacific Northwest, which is ideal for cross-country skiing. Nordic skiing can be found at Mt. Bachelor as well as the Deschutes, Ochoco and Willamette National Forests. Many of these areas are also open to snowmobiling and snowshoeing. In Bend and Redmond, ice-skating rinks open every winter. You can also enjoy an abundance of tasty restaurants, local breweries, and cute cafes whether you’re visiting for a family vacation, romantic holiday, or outdoor adventure. Click here to check accommodation in Redmond! Dubbed America’s Winter Playground since the 50s and Vermont gives visitors the quintessential New England experience. Quant villages with Mom and Pop shops and breakfast joints, Like Up for Breakfast in Manchester with fluffy pancakes and Vermont maple syrup will call to you with their small town welcome. Boasting 20 alpine ski resorts, big and small, rent some skis or a snowboard and take a lesson. If you already know what you’re doing Killington Resort will be sure to give you some thrills. If you’re not into flying down a mountain with something strapped to your feet (can you tell it’s not my thing either?) try snowshoeing. You’ll get to explore the natural beauty that Vermonters are so proud to call home. The Long Trail, which runs 272 miles from Massachusetts all the way north to the Canadian border, is great for snowshoeing. I’m a big fan of snowshoeing up Bromley Mountain. After your outdoor adventures go find a micro-brewery and warm up! Vermont has the most Breweries per capita of any other U.S. state. A few of my favorites are Long Trail Brewery, Switchback Brewing, and the Alchemist. While Vermont isn’t a specific city, you can drive most of the state in about 3 hours, which makes it easy to explore more than one place. But be warned, in winter roads can get a little crazy and GPS can’t tell if a road has been plowed or not! Adventure on my friends! A town named Coldfoot conjures images of brides running away or someone with frostbite on their feet. Well Coldfoot, Alaska is just that. It is a tiny town in interior Alaska along the Dalton Highway. Coldfoot’s record temperature during winter is -82 degrees Fahrenheit (-63.33 degrees Celsius). Coldfoot is about 60 miles north of the Arctic Circle. 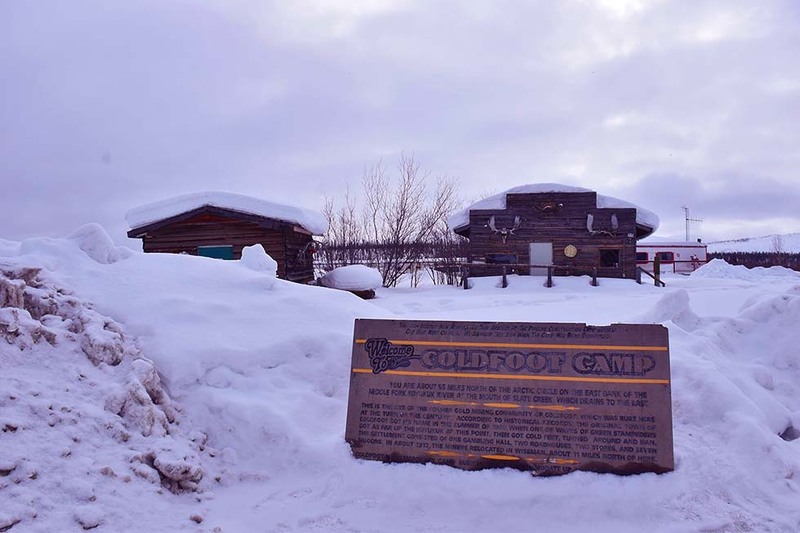 Coldfoot is home to 10-15 people, a café, a small bunkhouse, gas station, and a pub. Coldfoot might not seem like a tourist hot spot, but it is. What it lacks in amenities it makes up for in light shows. Northern Lights that is. Coldfoot sits right in the center of the Aurora Borealis belt. Being north of the Arctic Circle means that Coldfoot experiences plenty of darkness. During the winter, Coldfoot has 67 days where the sun will not rise at all. This means that during the winter there are 1,608 hours that the northern lights can be seen. Even spending a single day in Coldfoot gives one 24 hours of time where the lights can be seen. Winter in the Rocky Mountain National Park is truly amazing. If you love to hike, exploring the park on snowshoes is a bucket list must! The mountains and lakes are transformed into a blanket of snow for the snowshoe hares, elk, and coyotes to explore. There are several places we like to start. Bear Lake is probably the most popular trailhead for snowshoers, for a good reason! Hike around the lake for amazing views, giant icicles, and maybe a snowball fight! One of my favorite trails from Bear Lake is to Nymph Lake (about half a mile in) and gorgeous. Beyond it about a half mile, you reach Dream Lake, then another .8 miles to Emerald Lake. Usually, it depends on the weather how far you’d like to go. It can get cold and windy out on the lakes! Another favorite place of ours in winter is Hollowell Park. It’s a turnoff with a small parking lot a few miles before Bear Lake, and much less crowded. For kids, this is a fabulous flat area to explore and see some wildlife. For a longer hike, snowshoe up to Cub Lake. It’s 2.3 miles oneway from a trailhead of the same name and a 540-foot elevation gain. Before you go, it’s smart to stop into one of the local Estes Park snowshoe shops, such as the Warming House, and ask what the best trails are at the moment. Because they rent snowshoes and know what’s going on with weather and trail conditions in the park, they often can give great recommendations. Have fun! Big Bend National Park is located on the Southwest Border of Mexico and Texas, adjacent to the Rio Grande River. Since the highs in the national park reach well above 100 degrees Fahrenheit which results in some sections of the park to be closed, it is best to visit Big Bend during the winter. The winter weather is mild making hiking the trails much more comfortable. Plus, the park has hot springs you can enjoy were you to get chilly! 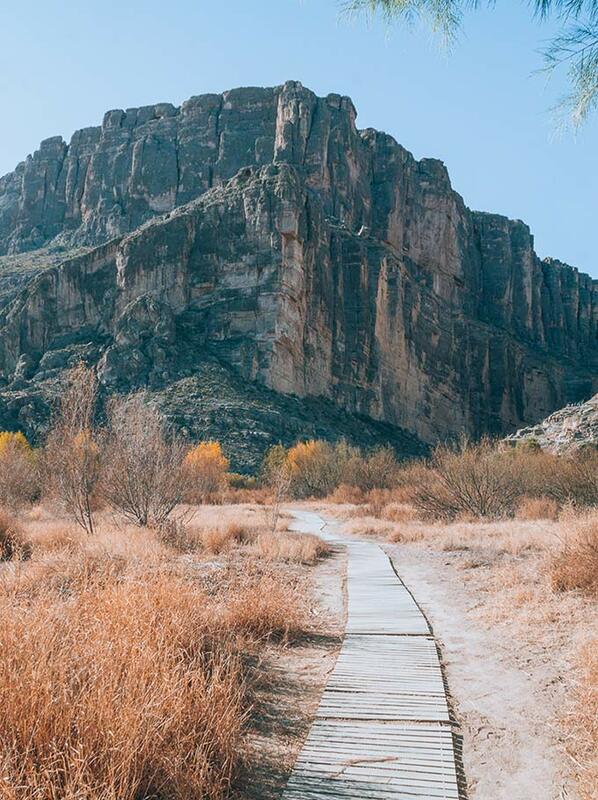 The best activity in Big Bend is to simply hike. Some of the most popular hikes include the Lost Mine Trail, The Window View Trail, The Grapevine trail, The Boquillas Canyon Trail, and the Santa Elena Trail. One of my favorite trails is the Santa Elena Trail as it takes you through the famous Santa Elena Canyon and the Rio Grande. Another one of my favorite activities is enjoying the Hot Springs located on the Rio Grande. The trail to this hot spring is an easy 0.5 miles. The area can get crowded, so I recommend going around sunrise to enjoy this place all to yourselves. If you ever get too hot, take a refreshing dip on the Rio Grande River. Big Bend National Park is not one of the more popular National Parks, but, it is indeed a hidden gem and a great spot to visit during the winter months. When you think of USA bucket lists, Yellowstone is an undeniable superstar. Yellowstone is nothing short of magical. 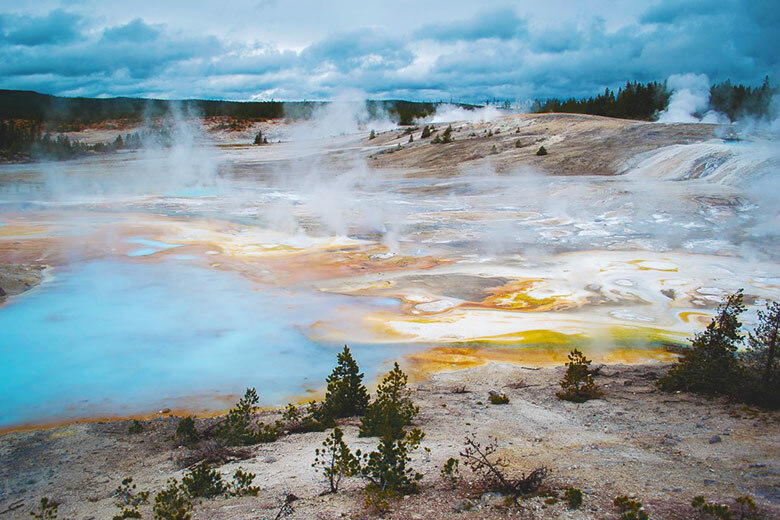 The bizarre geothermal features are absolutely otherworldly, and the wildlife viewing is some of the best you’ll find anywhere. The Absaroka Range provides a stunning backdrop to all the adventures you’ll have here, whether they’re on Yellowstone Lake or Yellowstone river, Grand Canyon of the Yellowstone or the Grand Prismatic Spring! Yellowstone’s busiest months are July and August, so visiting outside of that window is ideal. Most folks fly into Bozeman and rent a car. As for lodging, there are tons of options in and around Yellowstone. The key is to book as early as humanly possible. The historic Old Faithful Lodge, where you can watch Old Faithful erupt from your room, is the most iconic place to stay. That said, there’s plenty of other lodging in the park or neighboring small mountain towns. I stayed in the charming Cooke City before heading into the park to snag a campsite. You can reserve campsites in bigger campgrounds, or arrive bright and early to snag a first-come first-served site. There is no perfect number of days to spend in Yellowstone, but the longer the better! I stayed 4 days on my last trip, which was sufficient to see all the highlights (e.g. Grand Prismatic, Mammoth Hot Springs, Lamar Valley…), plus do some hiking, without feeling too rushed. Keep in mind, regardless of time frame, you’ll be doing a ton of driving. The Grand Loop, the main Figure-8 drive within Yellowstone National Park, is 142 miles! I promise, it’s more than worth it. San Antonio is a beautiful city in the State of Texas. Its moderate Southern climate and charming atmosphere make it a great destination for a winter getaway. Located mid-way between oil-city Houston and hip-town Austin, San Antonio preserves a unique vacation vibe unlike the mega-cities just hours away. It also holds an interesting piece of history, as it is the first chartered civil settlement in Texas. As such, there are numerous things to do in the city. The Alamo is a historic Spanish fortress founded in the 18th century and was a significant symbol during the Texas Revolution. A stroll through its gardens and a visit of its chapel will provide a side of history unfamiliar to many. Another point of attraction is the San Antonio Riverwalk. As the city’s temperature generally stays above 60 degrees on the coldest of its days, a casual walk along the riverbank is an enticing way to spend an evening with family and friends. San Antonio’s riverside is complete with adorable architecture, fancy restaurants, small shops, and street musicians. During the wintertime, holiday lights further accentuate its charm. Whether it is a margarita and some delicious guac by the waters or a ride in one of the many boats, endless hours can be spent here enjoying the contrast between nature and modernity, chatters and serenity. San Antonio is definitely one of my favorite winter destinations in Texas! Psst: Receive fresh travel tips in your mailbox. Subscribe to our newsletter! Which one of these places do you like the most? Or have you already been to one of them? Comment below your answers (or questions!). This entry was posted in United States and tagged Winter vacation.